This unusual, very colourful Eames ‚Bikini‘ Wire Chair is a custom-made product, uniquely manufactured by Vitra according to the individual wishes of a client in the early 1980s. Interestingly, when such custom-made products are produced, the company always makes two of them. Just as a precaution, if something goes wrong in the process and the comissioned object has a flaw in the lacquer or something similar. In this case, after delivery of the customer chair the second one, now redundant, found a new home with a Vitra employee – because both chairs were perfect. 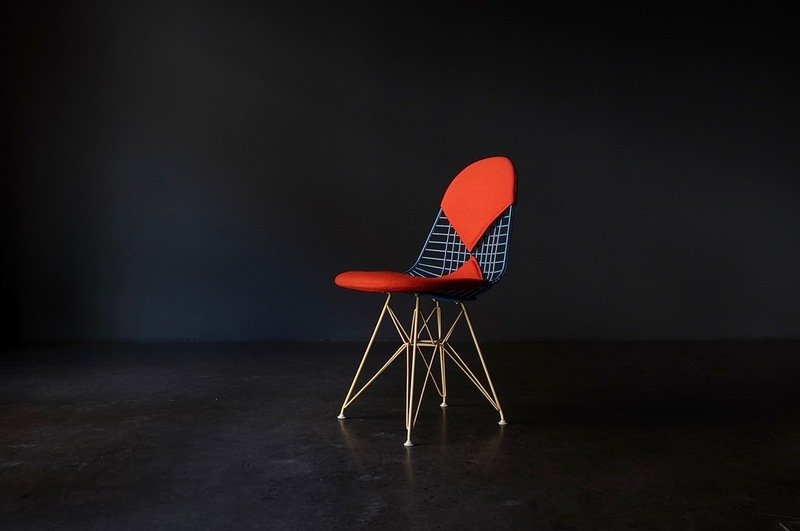 And from there, more than 30 years later, it found its way to us, including the information that the chair had been given the nickname „Harlequin“ due to its colourful design: white feet, the Eiffel base in delicate yellow, the wire shell in light blue lacquer, the bikini in orange-red hopsack fabrics, attached with wire. So, if you’re searching for a bit of fun in your surroundings, let the harlequin entertain you.